One of the several "Widgeons" currently on the market for sale is N4453, the former "Fantasy Island" Widgeon. 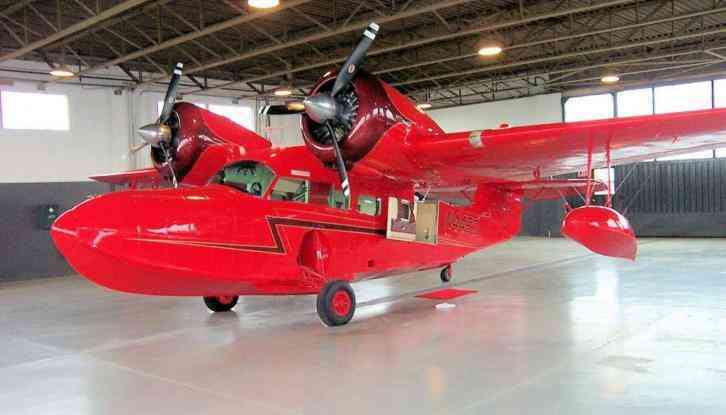 The thing is, they have it listed and advertised as a "1967 Grumman G-44A Widgeon" but as most fans of this Web forum already know, there is no such thing! Anyone who actually know anything about Widgeons knows that all of the 200 model G-44* Widgeons built actually by Grumman were produced during the war (World War II that is) - i.e. between 1940 and 1945. (*And of course, that includes the J4F-1 variants built for the USCG and the J4F-2 variants built for the US Navy.) Immediately after the war, Grumman produced another 76 model G-44A Widgeons with the enlarged and deeper bow section, but Grumman ended production of them by or before 1949. The final 41 Widgeons ever produced were all built by SCAN (as the "Type 30") in Rochelle, France between 1949 and 1952 or so. Of course, N4453 is one of the SCAN Type 30 Widgeons built in France by or before 1952, serial no. 31 to be exact, so it cannot be a "Grumman" and it cannot be a "1967" anything either. Per 14 CFR 45.13, every aircraft is properly identified based on who actually "built" it, as what, and with its actual date (year) of manufacture - which is not the same thing as date of issuance of a certificate of airworthiness. (That comes into play later....) So, even though it may be "covered" under the same FAA type certificate as the Grumman G-44A (i.e. A-734) N4453 was "built" actually by SCAN as a Type 30 in the 1950 to 1952 time frame, so that makes it a (let's call it) a "1951" SCAN Type 30, but it is NOT a "1967 Grumman G-44A"
Once again, as most folks already know, many of the SCAN Type 30 Widgeons were not sold initially and subsequently disassembled and put into storage for many years. It was only after most of those in storage were bought up by companies in the US that they were shipped "across the pond", re-assembled, converted with various American engines such as the 300 hp Lycoming R-680 radials installed on N4453. It was probably at that point in 1967 or so that N4453 was issued its first US certificate of airworthiness, but that is not its "date of manufacture." Also, while it may be possible that it was the "last" Widgeon to be so re-assembled and certified, it is not so likely that the current owner/seller's claim that it is the "last Widgeon ever built" has any merit or validity. In fact, it is much more likely that 10 other Widgeons were "built" or manufactured after it since it is serial no. 31 out of 41 known to have been built by SCAN. Is any of this significant? Actually yes! Because there are differences between the original Grumman G-44A Widgeons and the French-built SCAN Type 30 Widgeons which are only nominally "copies" of the G-44A; the French SCAN Type 30 Widgeons were built to different, i.e. metric standards in terms of materials and hardware and whereas the original Grumman-built aircraft were all Anodized for corrosion protection in salt water, none of the SCAN Type 30 Widgeons were so Anodized. To me, that in particular is a significant difference, so as I said before - Caveat Emptor! For the most part agree whole heartedly. It is weird circumstance though. The data plate on mine says, Manufactured by, under license to, model, manufacture completed by. When is manufacture completed? I'd like to know when mine was physically built, how far along the completion was before it was sold to the states. I do know McKinnon did significant work to the airframe for completion. Most of what Rajay says is correct. Most of the SCAN 30s were sold in N. America, but the majority of them went to Canada first. Lee Mansdorf imported them from Canada to the US. The first Mansdorf/SCAN 30 conversion was done in California and received it's Certificate of Airworthiness on March 16, 1955. N4453 WAS given it's Certificate of Airworthiness on Aug. 7, 1967 and by that date may well be the last Mansdorf/SCAN 30 conversion done, I haven't looked each one up and compared dates (and probably won't at this point). At any rate N4453 IS NOT a Widgeon, nor was it built by Grumman, it is a SCAN 30 with a Mansdorf engine conversion and other Mansdorf modifications. MrWidgeon wrote: Which airplane Mark ? And Bill, you seem to think differently, but I have no problem with calling a SCAN Type 30 a "Widgeon" just like an Eastern/General Motors TBM and FM-2 are also Avengers and Wildcats just like Grumman's original TBF and F4F respectively. mdwflyer wrote: For the most part agree whole heartedly. And Mark, if your SCAN Type 30 actually has a data tag that is in compliance with Note 5 of TC A-734, it is the first one that I have heard of as such! Note too though that there was nothing under that Note that said anything about "manufacture completed by..." As far as I am concerned, it was "manufactured" by SCAN and then "re-assembled" by Mansdorf, McKinnon, or whomever, which does not matter as far as the data tag is concerned. Last edited by Rajay on Mon Mar 21, 2016 5:16 pm, edited 2 times in total. Okay, THAT Mark. LOL ( I know a couple gents named Mark with Widgeons/SCANs). S/N 30 was one of 5 SCANs imported by McKinnon-Hickman in 1955 from Centravia S.A. in France. They were S/Ns 26-30, none show any records of having been completed prior to export to the US. So Mark's airplane may well have been COMPLETED by McKinnon. mdwflyer wrote: When is manufacture completed? I'd like to know when mine was physically built, how far along the completion was before it was sold to the states. I do know McKinnon did significant work to the airframe for completion. Per what Bill just said and this from Mark, I still refer back to my previous post (which I was apparently amending while Bill was posting his last.) AFAIK, McKinnon never had any kind of production or manufacturing authority pertaining to Widgeon airframes. It may be hairsplitting, but that still leaves us with SCAN being the "manufacturer" and McKinnon the "re-assembler" although I'd bet that the only or at least the primary way in which the SCAN Type 30 aircraft were not "completed" at the factory may have been limited to the engine installations - hence their attraction to the various engine "hot-rodders" like PACE/Mansdorf, McKinnon, Dean Franklin, etc. If the airframes were essentially complete, sans engines, and then disassembled, crated, and stored until those folks resurrected them and installed other kinds of engines on them per STC's, that does not change the fact that SCAN is the "manufacturer." And Mark, I don't have it in front of me - and not that it's 100% accurate in any case, but as I recall, Fred Knight's book on the Grumman seaplanes list the last production work on the Type 30 series being done by SCAN in Feb. 1952. Maybe that's when they shut down operations with several aircraft in various stages of completion - or maybe they were in fact "complete" except for the engines. We may never know for sure - it was so long ago! I'll have to go back and review what he has in his records for your airplane (s/n 28) in particular. Last edited by Rajay on Mon Mar 21, 2016 5:26 pm, edited 1 time in total. The last amendment to the type certificate was 1979. When was note 5 added? Interesting forensic semantics, was it there in 1956? What is Date of manufacture as applicable? Does the airplane have to have engines installed to be manufactured? Doesn't really matter, N4453 airplane is licensed and certified and has been since 1967. It's an oddball, and I hope it finds a good home. Mine is happily licensed in Canada, and I guarantee that neither I, nor Transport Canada would want to start digging. They have enough trouble getting the paperwork done on a basic import CofA. Rajay wrote: And Mark, if your SCAN Type 30 actually has a data tag that is in compliance with Note 5 of TC A-734, it is the first one that I have heard of as such! Note too though that there was nothing under that Note that said anything about "manufacture completed by..." As far as I am concerned, it was "manufactured" by SCAN and then "re-assembled" by Mansdorf, McKinnon, or whomever, which does not matter as far as the data tag is concerned.